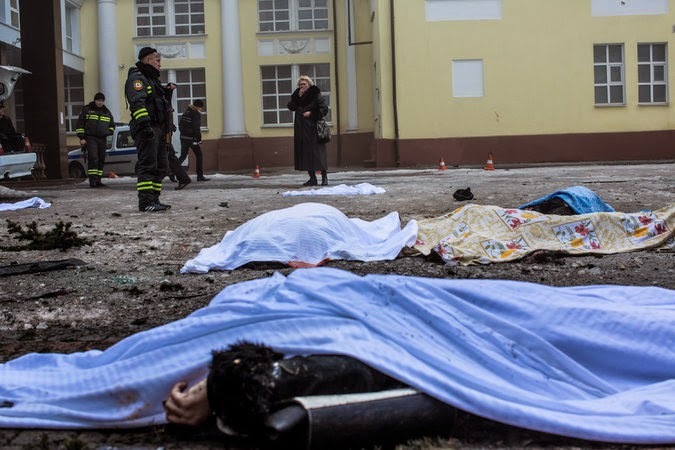 DONETSK, Ukraine -- Seven people were killed and at least three wounded in a pair of mortar attacks on the city’s west side Friday, including one that hit a crowd of people waiting in line to receive humanitarian aid as fighting raged outside of town. A series of explosions on Friday hit a parking lot in Donetsk where several hundred people had lined up for humanitarian aid meant for children and the elderly. The carnage ended nearly a day and a half of relative calm in the region controlled by pro-Russian separatists, where fighting between the rebels and the Ukrainian military has spiked sharply since a shaky cease-fire broke down this month. Officials of the Donetsk People’s Republic were quick to attribute the attacks to Ukrainian “saboteurs” who they said had infiltrated the city. “Once again we have the baseness and the meanness of the Ukrainian sabotage groups,” they said in a statement. A woman wounded in a rocket attack was treated in a hospital in Donetsk, Ukraine, on Monday. The body of her mother, who was killed in the attack, lay on a gurney nearby. Ukraine’s government, meanwhile, blamed provocateurs trying to derail the peace process for the attack. “The Ukrainian Army didn’t conduct any hostilities near the city of Donetsk today and had nothing to do with the fire on the humanitarian aid point,” said Vladimir Polevoy, deputy chief of the Information and Analysis Center of Ukraine’s Safety and Defense Council. Sounds of heavy shelling and rocket fire emanated from the ruined airport, the site of almost continuous hostilities despite a cease-fire that was declared on Sept. 5. Fighting was also reported around the town of Debaltseve, a railroad hub where a contingent of Ukrainian soldiers is surrounded on three sides by rebel troops. The first mortar strike in Donetsk landed shortly before 1 p.m. along Matrosova Street in a neighborhood of middle-class apartment blocks and small industrial facilities a few miles west of the city center. Lyudmila Inozemtseva, 55, said she had just gone into the bathroom to comb her hair when she heard three or four loud blasts. A few minutes later, there was another series of explosions a short distance away, she said. The initial strikes hit a trolley bus just outside Ms. Inozemtseva’s building and went into a neighboring apartment. Maria, 36, who declined to give her last name, said she had been drinking tea in the kitchen with her 3-year-old child when she heard a loud explosion. When she returned, she saw that the shell had gone through the window into her living room and a piece of shrapnel was embedded in the kitchen door. The body of an elderly man lay on the sidewalk just outside her apartment, while another man was sprawled beside a trolley bus stop down the block. The temperature hovered just above freezing so the blood pooled in ice crevices along the debris-covered sidewalk and turned the slush to pink. The second series of explosions hit about a half-mile away, in a parking lot shared by a neighborhood cultural center and the Hotel Europe. Several hundred people had been lined up there, or waiting in parked cars, to pick up humanitarian aid for children and the elderly. One woman who had been waiting near the head of the relief line, who would give only her first name, Lyudmila, said she had heard a series of explosions a short distance away followed quickly by an enormous blast very near her in the parking lot. Armed guards monitoring the crowd rushed her and several other people inside the hotel, she said. “I had come to pick up aid for my 82-year-old mother, who cannot get out of her apartment,” she said. The body of one man lay slumped inside his blue sedan while four others lay beneath blankets in the glass-and-debris covered lot. Three other vehicles were twisted and shattered by the explosions. Rimma Fil, coordinator of the humanitarian center for the Rinat Akhmetov charity fund, which had been distributing the aid, said the group was closing its distribution locations for the day, but hoped to reopen them as early as Saturday morning. The crowd at the attack site was so large, she said, because other centers for dispersing aid near the airport and in other dangerous neighborhoods had been closed in recent days, forcing people from several parts of the city to come there for aid. “We are not military people, we do not know what is going on,” Ms. Fil said. The sounds of a few more explosive bursts could be heard later in the afternoon in the same Kuybyshevsky district, but there were no further reports of casualties.